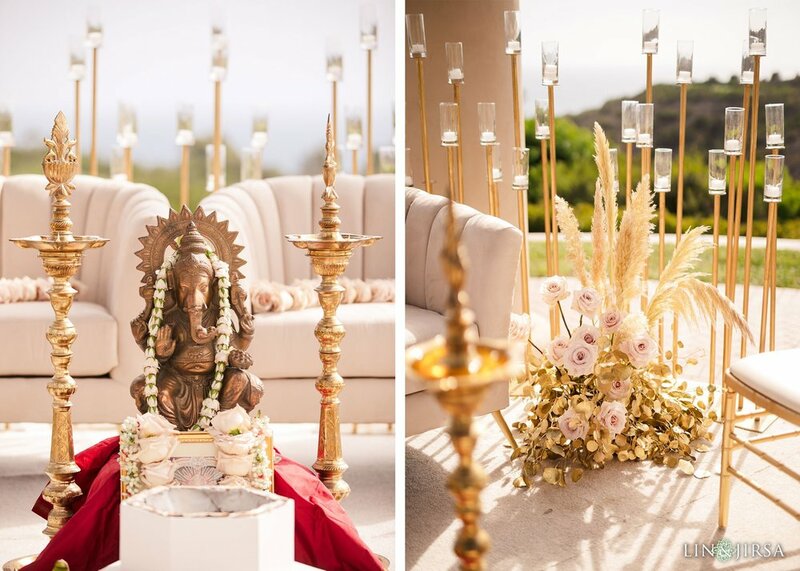 We had an amazing time creating this gorgeous ceremony for Anamika & Rahul’s special day. The wonderful golds and pinks of the Ceremony were then omitted as we moved onto the Dinner Reception, which was decorated in refined grays and whites with the addition of our smoked glass and mirrored vases. Pelican Hill Resort is a picturesque venue that we had the pleasure of working at many times throughout 2018. Just look at how gorgeous our couple looks nestled among the tables of their Reception while the silhouette of their Ceremony lies in the background! made up in brilliant shades of blue and gold. We embrace any opportunity to use elements from Ceremony into Reception, as can be seen with the repurposing of the custom floral peacock that previously rested beside the aisle.